Riad (dpo) - Over a billion people use WhatsApp – but in ultra-conservative Saudi Arabia, the American messaging service now faces trouble. 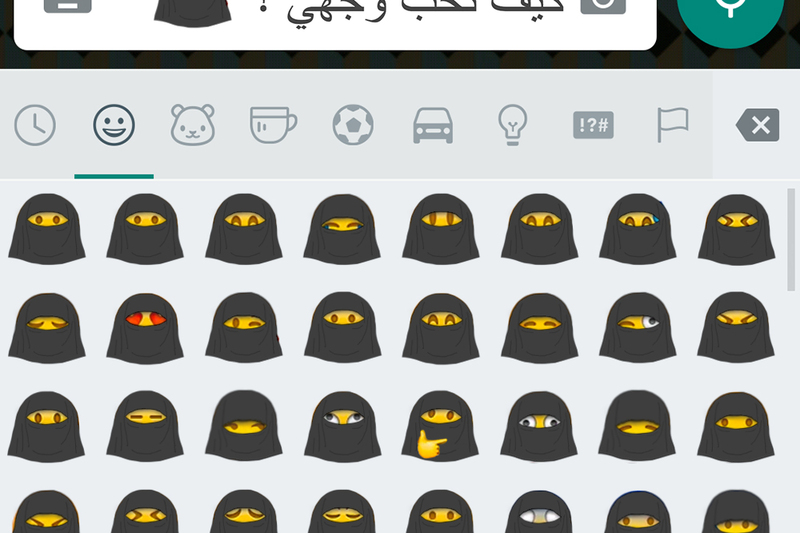 The Grand Mufti of the Saudi Kingdom issued a fatwa against unveiled emojis as they violate the nation’s own strict interpretation of Islam and therefore must be veiled at once. “Since there is no way of knowing whether emojis are supposed to be men or in fact, bald women, all of them have to be veiled just to be on the safe side”, explained a spokesperson of Grand Mufti Sheikh Abdul Aziz bin-Abdullah al-Sheikh whilst covering up a two metre tall (6’ 7”) cardboard winking smiley with a Saudi Arabian niqab for demonstration purposes. WhatsApp’s legal department tried to intervene, arguing that the bodiless emojis could in principle be seen as decapitated heads without a body and were thus perfectly apt for communication in the Arab world. However, the Grand Mufti remained firm on the matter. Meanwhile, the Saudi Arabian government has also demanded that further companies adapt their emojis. These include Twitter, Samsung, Google (Android) and Apple. At WhatsApp, the team is proud to have complied with Saudi Arabia’s requirements in next to no time. “From now on, all emotions will be expressed using the eyes”, one of the company’s designers explained. “This has enabled us to develop emojis especially for Arab women, expressing up to 50 different kinds of pain, fear and suppression.” As well as the veiled emojis, further new symbols have also been developed – for example, a chopped-off hand with thumbs up and a chopped-off hand with thumbs down. However, emojis which can clearly be identified as male remained unchanged, such as 👨, 🎅 and 🍌. Time and again, the internet, as well as individual computer games, have fallen victim to Islamic censorship. To this day, the classic game Tomb Raider remains a prime example. The Saudi Arabian version never took hold on the market – virtually no gamer mastered even the first level since Lara Croft kept constantly stumbling over her niqab.